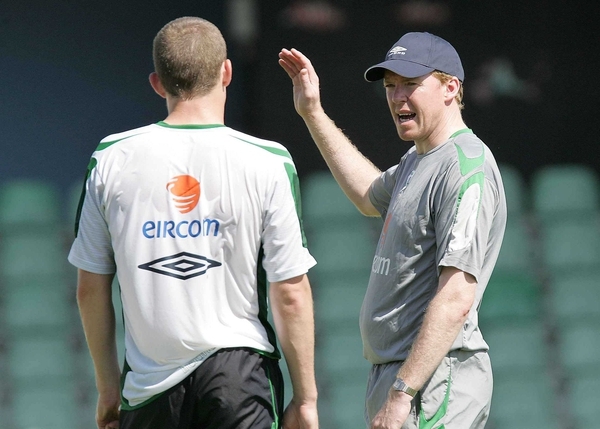 Steve Staunton's brave new world crumbled under the weight of abject humiliation as the Republic of Ireland suffered one of the worst defeats in their history, a 5-2 defeat to Cyprus. 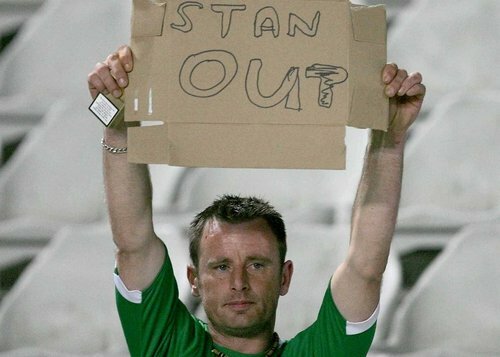 Any hope Staunton and Ireland had of qualifying for the Euro 2008 finals has now been shot to pieces after just two games, and in particular on the back of this shambolic showing. Not only did they concede five goals to a Cypriot team ranked 60 places below them in the FIFA world rankings, but to add to their night of unbridled misery, Richard Dunne was dismissed late on. Heaven knows where Staunton goes from here taking into account he was without the likes of Shay Given, Steven Reid, Graham Kavanagh, Stephen Carr and Kevin Doyle, this was a game Ireland should still not have lost by such an embarrassing margin. Serving a one-match touchline ban following his dismissal from the dugout in the 1-0 defeat against Germany in Stuttgart at the start of last month, Staunton must have watched in agony throughout. Mistake followed mistake, with the first in the fifth minute from Liverpool right-back Steve Finnan, who lost the ball midway inside his own half to Michalis Constandinou. That allowed the Olympiacos striker a free run on goal, but his flicked effort as Paddy Kenny came out to narrow the angle, was narrowly wide of the left-hand post. It was an almighty let-off for Ireland and they made Cyprus pay the price in the eighth minute when one of his newest recruits stroked home the opener. After a 6-1 loss in their opening game to Slovakia, the Cypriots' fragility in defence was brutally exposed again - although it was nothing compared to what followed from Ireland. A left-wing ball from Damien Duff was headed back by Aiden McGeady - the Celtic winger making his first competitive start - into the path of Stephen Ireland. The 20-year-old Manchester City starlet, with just one 42-minute substitute appearance behind him for his country, crashed home a sweet right-foot drive from 15 yards. Ireland, though, had failed to heed the earlier warning from their hosts and the errors continued to flow, initially from Andy O'Brien, and then Kenny. Portsmouth centre-back O'Brien, yet to play in the Premiership this season, ballooned a raking ball from Georgos Theodotou into the air. This time Constandinou made no mistake with the gift, sidefooting past Kenny into the bottom right-hand corner from 10 yards for the first goal Ireland had conceded in six meetings with the Cyprus. After Kenny saved a rising 20-yard drive from Yiannakis Okkas soon after, it was the turn of the Blades goalkeeper to suffer embarrassment in the 16th minute as Cyprus took a 2-1 lead. As replacement for Shay Given, who last month required surgery to repair a perforated bowel and who was a hero on this ground last year when Ireland narrowly won a World Cup qualifier, Kenny sadly showed he is not in the Newcastle star's class. Kenny's woeful attempt at clearing a right-wing ball from Lambros Lambrou, punching thin air, allowed Alexis Garpozis a free header into an unguarded net from 10 yards. Ireland at least responded, with skipper Robbie Keane heading against the post, while Kevin Kilbane and Clinton Morrison also went close. Portuguese referee Lucilio Cardoso Baptista briefly took centre stage with four bookings in five minutes before Ireland levelled just before the break. Dunne, crucially one of those cautioned, powerfully headed home a Duff cross for his first goal for his country for more than three years. Even then Ireland could have been a goal down at the break, only for Kenny to partially atone for his earlier mistake by making a fingertip stop in pushing a Constandinou shot onto the bar. The interval should have afforded Ireland the opportunity to regroup and gather their composure under the guidance of assistant Kevin MacDonald. Instead, worse followed as O'Brien was then guilty of bundling over Stathis Aloneftis inside the area in the 51st minute. Constandinou scored his second of the game from the penalty spot, sending Kenny the wrong way as he sidefooted home. Nine minutes later and Ireland's misery was compounded, this time as further defensive indecision allowed Constantinos Makrides to tee up half-time substitute Constantinos Charalambidis. Then in the 75th minute came a fifth goal for Cyprus, with Kenny initially producing a brilliant save in blocking a Constandinou header as he rose unmarked to meet an Aloneftis left-wing cross. But there was nothing Kenny could do as Charalambidis followed up to ram home the rebound from inside the six-yard box. Soon after came Dunne's dismissal for a second bookable offence and a questionable foul on Okkas, but by then all the damage had been done.